The Orbán government’s efforts to falsify history are proceeding full steam ahead. The “madness”–as Imre Mécs, one of the heroes of 1956, called it–continues. It looks as if Viktor Orbán refuses to listen to reason and insists on erecting a monument that depicts suffering Hungary as Archangel Gabriel at the mercy of the German imperial eagle. The originally stated purpose of the statue was to commemorate the German occupation of Hungary on March 19, 1944. 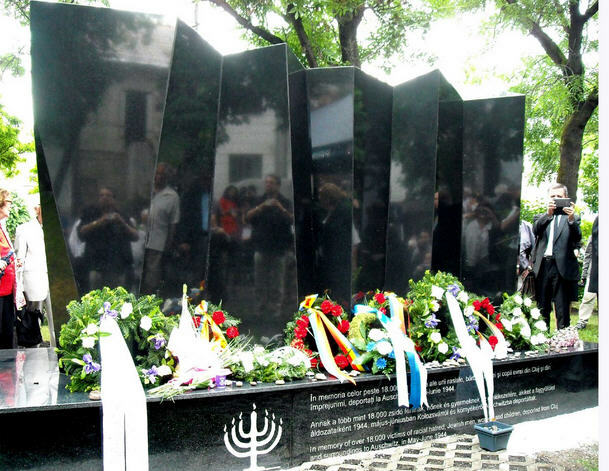 After the first outburst of indignation, the monument’s rationale was changed to a commemoration of the victims, both Jewish and non-Jewish, of German aggression. There is only one problem with the whole concept. Hungary was an ally of Germany, and it was a legitimate Hungarian government that handled the deportation of about 600,000 Hungarian citizens of Jewish heritage. Not without reason, critics of the whole idea of the monument suspect that the Orbán government wants to shake off any responsibility for the Holocaust and to shift the blame entirely to Germany. The protest around the foundation being built for the future monument has been going on for two weeks. Today about twenty people were removed and taken to police headquarters. The two best known demonstrators who were taken away are Imre Mécs, a former member of parliament who was sentenced to death as a result of his participation in the 1956 revolution, and his wife Fruzsina Magyar, a well-known dramaturgist. It seems unlikely that the “madness” will end any time soon. Not only will the memorial stand but Sándor Szakály, a historian with far-right political views, will remain the director of the newly created historical institute,”Veritas.” As far I as can see, this new institute will be the government’s vehicle for a revisionist interpretation of modern Hungarian history. And we can only expect more historical madness. Just wait until young historians affected by the extremist ideology of Jobbik begin writing their own revisionist interpretations of historical events. Mazsihisz, the umbrella organization of Jewish groups, objected to Szakály’s appointment, but considering that Sándor Szakály just signed a document ensuring long-term cooperation between the Veritas Institute and the Holocaust Documentation and Memorial Center, we can be sure that Szakály’s appointment is secure. How could it happen, one might ask, that the Holocaust Documentation Center would ever sign such a document? The answer is simple. One of the first acts of the Orbán government was a personnel change at the head of the Holocaust Documentation and Memorial Center. The old appointees were fired and the new guard arrived. At that point it was clear that the Orbán government had plans for the Center. Since the Memorial Center is financially dependent on the government, Viktor Orbán thinks he has every right to run the place the way he likes. In his world there is no such thing as an independent foundation. So, while Mazsihisz stands against Szakály’s appointment, the Orbán-appointed head of the Holocaust Memorial Center, György Haraszti, signs an agreement of long-term cooperation with the head of Veritas. On the face of it, it might seem that Orbán managed to split the Jewish community, but my feeling is that most Hungarian Jews applaud Mazsihisz and have a rather low opinion of the new head of the Holocaust Memorial Center. Last Sunday’s March for Life, a yearly gathering in remembrance of the Holocaust, was the largest ever, definitely more than 30,000 people. The crowd filled the streets between the Danube and the Eastern Station. Quite a distance. 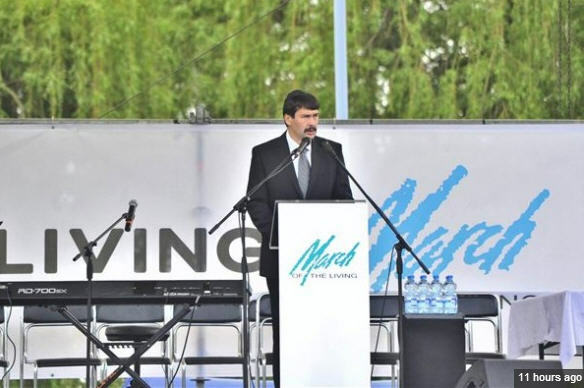 The government was represented by President János Áder, who then joined the International March for Life on a pilgrimage to Auschwitz. 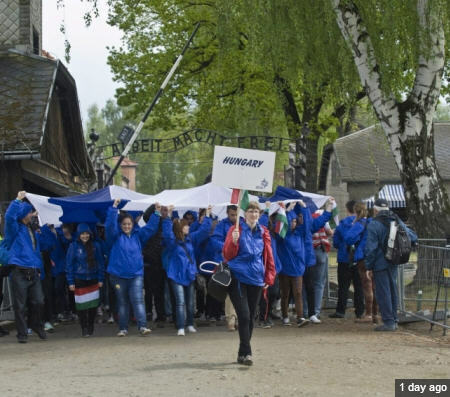 This year the Hungarians led the procession from Auschwitz to Birkenau because of the 70th anniversary of the Hungarian Holocaust. These are very strong words. The strongest I have ever heard from a member of the Orbán government. I can’t quite decide how to interpret them. I have the feeling that this was Áder’s first visit to Auschwitz-Birkenau, and I understand that the place makes an incredible impression on visitors. Perhaps the president changed his speech in the last minute to place greater emphasis on Hungary’s guilt than he had originally planned. Perhaps he was simply saying what he thought the pilgrims expected to hear. Perhaps he really does believe that the Hungarian government was complicit. In any case, Áder’s admission of Hungarian guilt stands in stark contrast to what Viktor Orbán, László Kövér, and Zoltán Balog think of Hungary’s anti-Semitic past. Áder didn’t look for excuses, he didn’t try to bury uncomfortable truths. Was this an example of what we call the good cop, bad cop syndrome or was it genuine? I don’t know whether we will ever be able to answer this question properly given the tight-lipped Fidesz leaders. As for whether the Germans were true occupiers or not, here is an amusing story. A few days ago neo-Nazi groups also decided to demonstrate on Szabadág tér. Great was the panic among the anti-monument demonstrators. They were afraid of physical attacks by these skin heads. To their surprise it turned out that, just like the Budapest liberals, the neo-Nazis came to demonstrate against the monument. Why? Because, as they explained, the Germans did not occupy Hungary. How could they? Hungarians and Germans were comrades-in-arms who fought together against Bolshevism. No comment.